Restoration Resources carries a varied selection of old and antique furniture, from simple styles to ornately carved, including tables, chairs, benches, cabinets, and book cases, from mid 1800's to 1950, generally priced from $25 to $1500. The furniture selection shown is just a small sampling of what we may have in stock at any given time and what is actually available in our 7,000 sq. ft. showroom in Boston. Pictured below: Farm table. 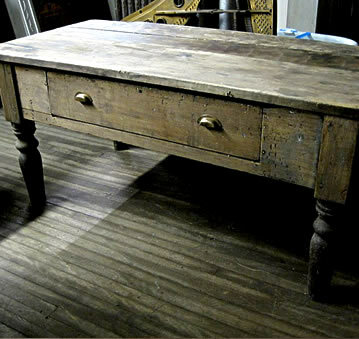 Tabletop Measures: 71" x 36", Table is 32"h. $600. Please note that most of our reclaimed pieces are hard to find and one-of-a-kind, so if you are interested in these items, we recommend that you email or phone us right away! Email us for larger photos.